Alex, G. (2010). Medizinische Diversität im postkolonialen Indien. Dynamik und Perzeption von Gesundheitsangeboten in Tamil Nadu. Berlin: Weißensee Verlag. Caglar, A., & Glick Schiller, N. (Eds.). (2010). Locating Migration: Rescaling Cities and Migrants. Ithaca: Cornell University Press. Vertovec, S. (Ed.). (2010). Anthropology of Migration and Multiculturalism: New Directions. London: Routledge. Vertovec, S. (Ed.). Depicting Diversities. 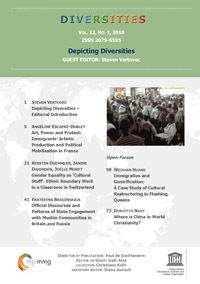 Special issue of Diversities 12(1). Vertovec, S. (Ed.). (2010). Theories. London, New York: Routledge. Vertovec, S. (Ed.). (2010). Types. London, New York: Routledge. Vertovec, S. (Ed.). (2010). Trends. London, New York: Routledge. Vertovec, S. (Ed.). (2010). Policies. London, New York: Routledge. Vertovec, S. (Ed.). (2010). Processes. London, New York: Routledge. Vertovec, S., & Wessendorf, S. (Eds.). (2010). The Multicultural Backlash: European Discourses, Policies and Practices. London, New York: Routledge. Caglar, A., & Glick Schiller, N. (2010). Introduction: Migrants and Cities. In A. Caglar, & N. Glick Schiller (Eds. ), Locating Migration: Rescaling Cities and Migrants (pp. 1-22). Ithaca: Cornell University Press. Caglar, A., & Glick Schiller, N. (2010). Migrants and Cities, not Migrants in Cities: Components of a Theory of Locality in Migration Studies. In A. Caglar, & N. Glick Schiller (Eds. ), Locating Migration: Rescaling Cities and Migrants (pp. 60-84). Ithaca: Cornell University Press. Huang, W. (2010). Immigration and Gentrification - a case study of cultural restructuring in Flushing, Queens. Depicting Diversities, 59-72. Joshi Parkin, V. (2010). Nagaland and Nagas of Manipur. In J. Dhamija (Ed. ), Encyclopaedia of world dress and fashion, volume South Asia and Southeast Asia (pp. 205-211). Oxford: Berg Publishers. Nagy, D. (2010). Feuerdrachen: Chinesische Gemeinschaften in Mittel- und Osteuropa. China Heute, 29(4), 235-245. Nagy, D. (2010). Where is China in World Christianity? Depicting Diversities, 73-86. Ngo, T. (2010). Ethnic and Transnational Dimensions of Recent Protestant Conversion among the Hmong in Northern Vietnam. Social Compass, 57(3), 332-344. Nieswand, B. (2010). Enacted Destiny. West African Charismatic Christians in Berlin and the Immanence of God. Journal of Religion in Africa, 40, 33-59. Nowicka, M. (2010). Exkurs zum Begriff der Migration. In A. Bührmann, U. Fischer, & G. Jasper (Eds. ), Migrantinnen gründen Unternehmen. Eine empirische Analyse und die Entwicklung innovativer Beratungskonzepte (pp. 33-42). München/Mering: Rainer Hampp Verlag. Nowicka, M. (2010). Hängen geblieben': Bildungsmigranten aus Polen und ihre Zukunftsperspektiven in Deutschland und Europa. In D. P. Institut (Ed. ), Jahrbuch Polen 2010 Migration (pp. 86-99). Wiesbaden: Harrassowitz Verlag. Schmid, K., Hewstone, M., Tausch, N., Jenkins, R., Hughes, J., & Cairns, E. (2010). Identities, Groups and Communities: The Case of Northern Ireland. In M. Wetherell, & C. Mohanty (Eds. ), The Sage Handbook of Identities (pp. 455-475). London: Sage. Schmid, K., Tausch, N., & Hewstone, M. (2010). The Social Psychology of intergroup relations. In G. Salomon, & E. Cairns (Eds. ), Handbook of Peace Education. Lawrence Erlbaum. Schönwälder, K. (2010). Beyond the Race Relations Model: Old Patterns and New Trends in Britain. In M. Bommes, & D. Thränhardt (Eds. ), National Paradigms of Migration Research (pp. 109-125). Göttingen: V&R. Schönwälder, K. (2010). Einwanderer in Räten und Parlamenten. Aus Politik und Zeitgeschichte, 46-47, 29-35. Retrieved from http://www.bpb.de/files/WPRGPM.pdf. Schönwälder, K. (2010). Germany: Integration policy and pluralism in a self-conscious country of immigration. In S. Vertovec, & S. Wessendorf (Eds. ), The Multicultural Backlash: European Discourses, Policies and Practices (pp. 152-169). London, New York: Routledge. Shaery, R. (2010). Political Society and Civil Society in Syria. The Politics of a-Politicization. Civil Society in West Asia, II, 3-4.
van der Veer, P. (2010). Body and Mind in Qi Gong and Yoga. A Comparative Perspective on India and China. Eranos Yearbook, 69, 128-141.
van der Veer, P. (2010). Nationalism and Christianity. In D. Patte (Ed. ), The Cambridge Dictionary of Christianity (pp. 855-856). Cambridge: Cambridge University Press. van der Veer, P. (2010). Religions in India and China today. In E. Ben-Rafael, & Y. Sternberg (Eds. ), World Religions and Multiculturalism (pp. 257-276). Leiden: Brill. van der Veer, P. (2010). Spirituality: East and West. Eranos Yearbook, 69, 45-61.
van der Veer, P. (2010). The value of comparison. The Newsletter, 54, 19.
van der Veer, P. (2010). The Visible and the Invisible in South Asia. In B. Meerten ter Borg, & J. W. van Henten (Eds. ), Powers. Religion as a Social and Spiritual Force (pp. 103-115). New York: Fordham University Press. Vertovec, S. (2010). Cosmopolitanism. In K. Knott, & S. McLoughlin (Eds. ), Diasporas: Concepts, Identities, Intersections (pp. 63-69). London: Zed Books. Vertovec, S. (2010). General Introduction. In S. Vertovec (Ed. ), Migration, Vol. I: Theories (pp. 1-8). London, New York: Routledge. Vertovec, S. (2010). Introduction. In S. Vertovec (Ed. ), Anthropology of Migration and Multiculturalism: New Directions (pp. 1-17). London: Routledge. Vertovec, S. (2010). Introduction. In G. Baumann, & S. Vertovec (Eds. ), Conceiving Multiculturalism: From Roots to Rights (pp. 1-5). London, New York: Routledge. Vertovec, S. (2010). Introduction: Depicting diversity. Diversities, 12(1), 1-3. Retrieved from http://www.mmg.mpg.de/fileadmin/user_upload/Subsites/Diversities/Journals_2010/2010_12-01_Gesamt.pdf#page=5. Vertovec, S. (2010). Super-diversity and its implications. In S. Vertovec (Ed. ), Anthropology of Migration and Multiculturalism: New Directions (pp. 65-96). London: Routledge. Vertovec, S. (2010). Towards post-multiculturalism? Changing communities, conditions and contexts of diversity. International Social Science Journal, 199, 83-95. Vertovec, S., & Wessendorf, S. (2010). Introduction. In S. Vertovec, & S. Wessendorf (Eds. ), The Multicultural Backlash: European Discourses, Policies and Practices (pp. 1-31). London, New York: Routledge. Vigneswaran, D., & Quirk, J. (2010). Past Masters as Modern Inventions: International Relations History as Critical Theory. International Relations, 24(2), 107-131. Vigneswaran, D., Araia, T., Hoag, C., & Tshabalala, X. (2010). Criminality or Monopoly? Informal Immigration Enforcement in South Africa. Journal of Southern African Studies, 36(2), 465-482. Wessendorf, S. (2010). Local attachments and transnational everyday lives: Second-generation Italians in Switzerland. Global Networks, 10(3), 365-382. Wessendorf, S. (2010). State-Imposed Translocalism and the Dream of Returning. Italian Migrants in Switzerland. In L. Baldassar, & D. Gabaccia (Eds. ), Intimacy and Italian Migration. Gender and Domestic Lives in a Mobile World (pp. 157-169). New York: Fordham University Press. Gamlen, A. (2010). International Migration Data and the Study of Super-Diversity. MMG Working Paper, 10-05. Horstmann, A. (2010). Confinement and Mobility: Transnational Ties and Religious Networking among Baptist Karen at the Thailand-Burma Border. MMG Working Paper, 10-16. Nieswand, B. (2010). Diversität und Gesellschaft. Jahrbuch der Max-Planck-Gesellschaft. Nieswand, B. (2010). Nationalist Rituals and the Construction of Diaspora. The fiftieth anniversary of Ghanaian Independence in Berlin. MMG Working Paper, 10-09. Nowicka, M. (2010). Transcultural encounters of diversity – towards a research agenda. The case of Polish presence in the UK. MMG Working Paper, 10-04. Schönwälder, K., & Kofri, C. (2010). Diversity in Germany’s Political Life? Immigrants in City Councils. MMG Working Paper, 10-17. Schönwälder, K., & Kofri, C. (2010). Vielfältige Gesellschaft – homogene Parlamente? Einwanderer in den Räten von Nordrhein-Westfalens Großstädten. MMG Working Paper, 10-17-de. Vertovec, S., Schönwälder, K., & Petermann, S. (2010). Diversity, Social Interaction and Solidarity. Research Perspectives 2010+ of the Max Planck Society, 82-83. Vigneswaran, D. (2010). Being like a State: Policing Space in Johannesburg. MMG Working Paper, 10-15. Vigneswaran, D., Yaso, M., & Hornberger, J.(2010). Policing the Beat: Music Piracy in Downtown Johannesburg (http://www.migration.org.za/sites/default/files/reports/2011/Policing_the_Beat.pdf). Vigneswaran, D. (2010). Searching for Reconciliation: Policing, Injustice and Territoriality in Johannesburg. MMG Working Paper, 10-06. Vorng, S. (2010). Samsaric Salvation: Prosperity Cults, Political Crisis, and Middle Class Aspirations in Bangkok. MMG Working Paper, 10-14. Wessendorf, S. (2010). Commonplace Diversity: Social Interactions in a Super-diverse Context. MMG Working Paper, 10-11.